... because the world needs you functioning at your best! This idea of self-care is often tossed around flippantly. You can find endless articles recommending that you take some me-time, get a massage, or do some yoga. But self-care (and the lack of it) goes much deeper than that. When self-care is lacking, everything else can feel like it’s falling apart. When you have neglected your own needs for too long, a candlelit bath seems like a band-aid instead of a real solution. We tend to be the hardest on ourselves. We think that we need to sleep less, enrich our kids more, cook healthier meals, work harder, be more fit, etc… and we think that we need to do it all with a smile. After all, isn’t that what everyone is doing? We consistently compare our own weaknesses to other people’s strengths while underestimating our own super powers. We consistently see the struggle in others while neglecting our own. We consistently feel like we are falling short, when in reality we are doing a pretty amazing job. All of this is normal, but it doesn’t mean that we shouldn’t take strides to change things. We should take credit for all of the amazing things that we do and start to simplify our lives as much as we can. No one is capable of doing it all – at least not long term. We can only be everything to everyone for so long until it takes it toll. My suspicion is that burnout is much more common than we realize. It is also much more serious than we realize. If we are going through life by frantically jumping from one task to another without any time for reflection or creative, we are on the quick path to burnout. Many times we hear about burnout in the workplace, but it can also happen at home. It is possible to experience burnout in various areas of our life. Simple things like packing lunches can start to feel daunting when burnout has set in. The symptoms of burnout are caused by being in an ongoing state of stress and include: emotional and physical exhaustion, cynicism and detachment, and feelings of being ineffective or unaccomplished. For many of us, these probably sound all too familiar. It’s important to remember that burnout occurs on a spectrum. The severity of what we are experiencing can vary, but at any stage it is important to address! These symptoms tend to creep up on us, and we don’t recognize them until they have gotten to the point where it is making it difficult to function on a daily basis. Our goal should be to recognize these symptoms earlier before it gets to such a dark and difficult place! As soon as you start to recognize these symptoms in yourself, you should begin to take action. We tend to think that we should power through and just buckle down and make things work, but sometimes taking a step back from it all can be the best remedy! Figuring out what you truly need is an important step in this process, but there are no quick-fixes! We need to care for ourselves enough to recognize when we are trying to push ourselves beyond our limits. 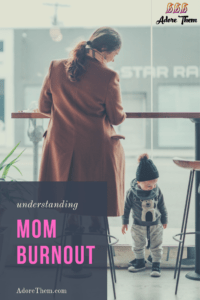 Working on balance and self-care means that you will be able to be a better parent, partner, and employee so why would you push that to the back-burner? As a good first step, I want you to take the time to write down all of your responsibilities. Every tiny little thing that you keep in your head and manage for yourself, your family, your friends, your community, and your work. Just get it all down on paper. Doing this simple task will help you realize just how much you do on a daily/weekly/monthly basis. You will start to understand why you are feeling overwhelmed. Simply acknowledging the stress, the overwhelm, and the burnout can be therapeutic in and of itself. But don’t let is stop there. What is most important to you? What has to happen? What do you love doing? Are you making those the priority? Or are they getting lost in the rest of less important noise? You get to be in control of your ownlife! You get to call the shots and make changes as-needed. Keep recognizing the signs and keep working on how you can avoid full-blown burnout. Because the world needs you functioning at your best!